Oscar nominations were announced this morning and Pixar has received two for both Animated Short and Animated Feature. This is Brad Bird’s fourth Oscar nomination for a Pixar film. He was previously nominated for The Incredibles and Ratatouille in the Animated Feature and Original Screenplay categories. Those films won Best Animated in 2005 and 2008, respectively. Producer John Walker was also nominated for the first Incredibles. This is Nicole Paradis Grindle’s third Oscar nomination as producer after The Incredibles, “Sanjay’s Super Team” (Best Animated Short) and Inside Out, the latter of which also won Best Animated in 2016. “Bao” was unfortunately overlooked in this category for the Annie Awards, so it’s especially wonderful to see it receive this recognition. And it’s all the more exciting because this is Domee Shi’s first ever nomination! That’s quite a feat for a rookie filmmaker’s debut! Although not a Pixar production, the surreal “Weekends” up for Best Short was directed by Pixar story artist Trevor Jimenez. 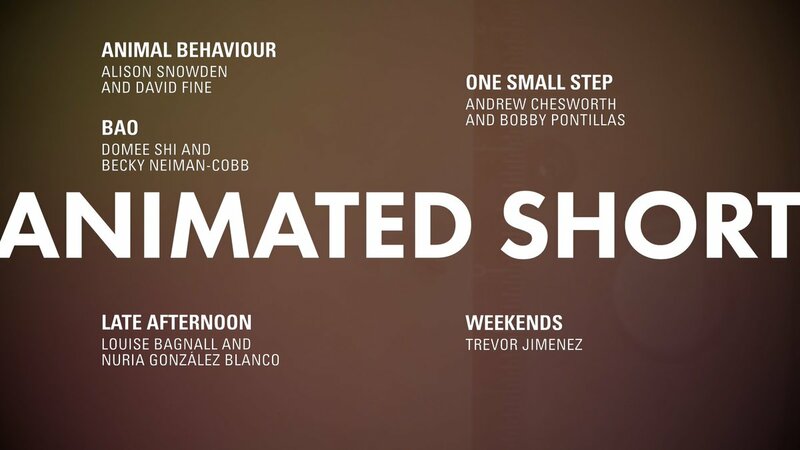 It’s still disappointing that the directors and writers on animated films can’t be recognized with nominations (or awards) in other categories besides Best Animated. Inside Out, along with The Incredibles, was nominated for Best Original Screenplay, but there should be more animated films to join them. Same goes for Best Director. Nevertheless, we want to congratulate all of the nominees in both categories for some stellar films this year! Tune in to the 91st Academy Awards on February 24th, 2019. The Incredibles 2 director was a guest on Deadline’s Crew Call podcast recently. The film has enjoyed massive success since its June debut earlier this year, and has earned an impressive number of nominations at the Annies and Golden Globes. Bird mainly discussed the notable improvements in CGI, a huge leap from the “edge of failure” he and the crew were on in the first film. The technology is continuously evolving with dazzling results. Bird also spoke about his live action ventures. His 1906 epic about that year’s devastating San Francisco earthquake was never formally greenlit due to problems with budget and the story. Bird revealed that tackling the story has posed the most significant obstacle, but he remains enthusiastic about it nonetheless. The film was originally going to be produced by both Pixar and Warner Bros. Is there a chance it could still see the light of movie screens someday? Bird hopes so. But he’s also working on another live action project! He couldn’t say any more beyond that (of course), but it will feature twenty minutes of animation. Immediately I thought of “The Origins of Plus Ultra,” a seriously cool animated sequence that was ultimately cut from Bird’s Tomorrowland. Besides discussing his films and upcoming projects, Bird offered his thoughts on Pixar’s new direction. I believe this is the first time someone at the studio has directly addressed John Lasseter’s departure. Bird didn’t comment on the allegations of misconduct against the former studio chief, but he did remark positively on where Pixar is headed. Brad Bird’s optimism is encouraging and justified. Just as the technology evolves, so does the studio. 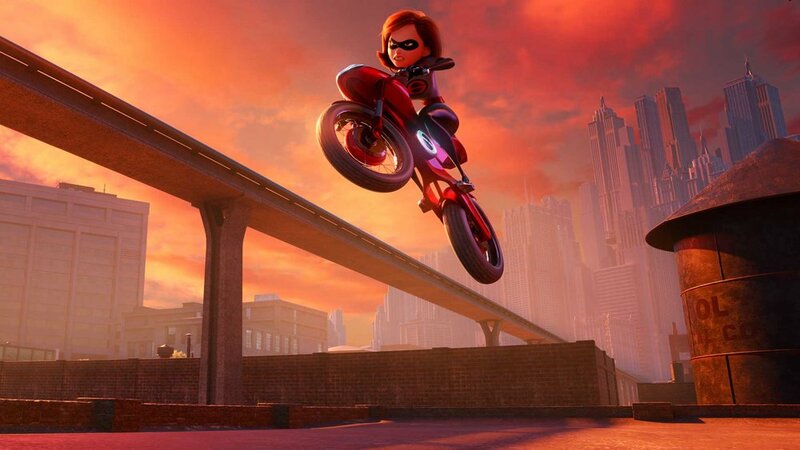 The nominations for Incredibles 2 keep rolling in – just after receiving 11 nominations at the Annie Awards, it has now been nominated for Best Animated Motion Picture at the 76th Annual Golden Globe Awards. 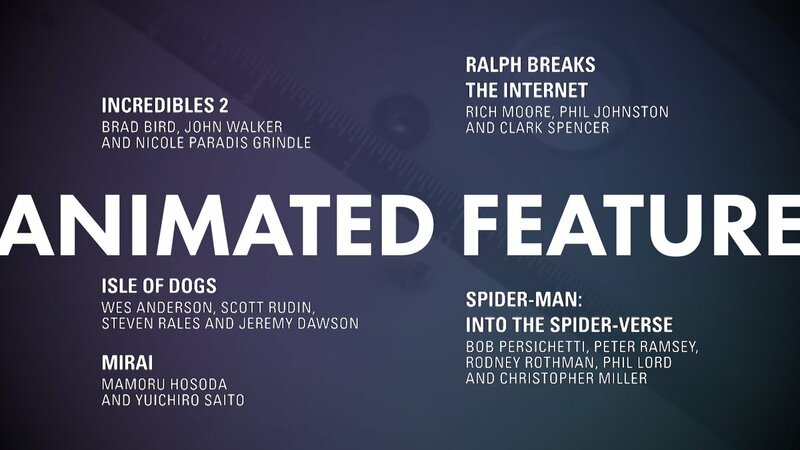 Incredibles 2 sits amongst fellow worthy nominees Isle of Dogs, Mirai, Ralph Breaks The Internet, and Spider-Man: Into The Spider-Verse. The Golden Globe awards will air on January 6th, so we’ve just got a month until we find out the result! Regardless of the outcome, it’s great to see Incredibles 2 receiving so much praise – we’re beyond happy for the entire crew. Following the nomination announcements, director Brad Bird revealed that he was initially worried the sequel wouldn’t prove as popular as the original – he was afraid superheroes wouldn’t be ‘in’ any more. (Ironic, given the fact that the new animated Spider-Man movie has also been nominated for best animated feature.) But he realised that Incredibles is more than a superhero movie – family is at the core of these films, even during those classic fight scenes. 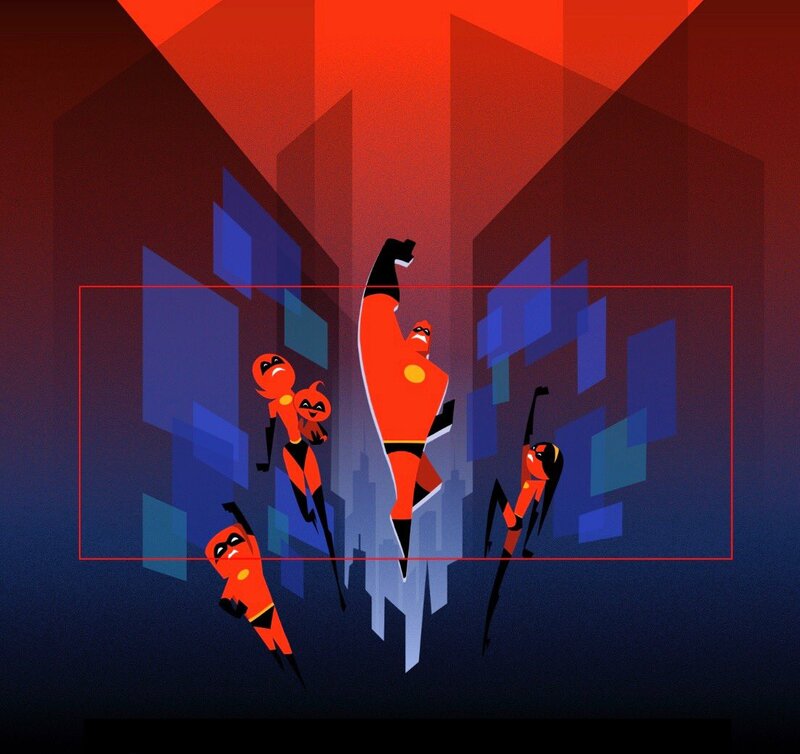 How many times did you see Incredibles 2 in theaters? But maybe the more important question is how many times do you plan on watching it now that it’s been released on digital and Blu ray? You can watch the movie again (or for the very first time!) in the comfort of your own home, or anywhere else with your laptops, iphones, and other devices. But the really amazing thing is that you don’t have just the movie at your fingertips, but a wealth of bonus features. As is the case with Pixar home releases, you can expect both quality and quantity. Joanna and I were so excited about the special features that we teamed up for this post to break them all down. Read on for our favorites! I’m always a fan of the Pixar audio commentaries, and I remember especially loving it on the original The Incredibles DVD because you had the choice to listen to either the director’s commentary or the animator commentary. The animator commentary makes you see the movie in a whole new light, and it really gives you an insight into how the whole animation process works. It feels like such a treat to have the commentary on Incredibles 2 led by animators again (supervising animators Dave Mullins, Alan Barillaro, and Tony Fucile, and animation second unit and crowds supervisor, and also the voice of Kari, Bret Parker). These animators all worked on The Incredibles back in 2004, and it was so interesting to hear about the technological advances and how much has changed (for the better!) in how animated movies are created. There are also some great Easter Egg reveals in the commentary – the Godzilla-like creature shown on the TV during the motel dinner scene is actually Jonesy the iguana from “Toy Story of Terror!” And the ‘num-num cookies’ that Jack-Jack will do anything for are based off of the apparently delicious cookies that are served in the Pixar cafeteria. If you missed Kari the babysitter in Incredibles 2, then you’ll want to keep listening right to the end – in what can only be described as the perfect finale to the commentary, Bret Parker brings her back to life as the credits roll down the screen. Brad Bird’s passion for animation is irresistible. Running about 20 minutes long, “Strong Coffee” is a tribute to the director. Joanna says that this featurette really shows how much Brad Bird pushes the team. She always thought The Incredibles was a leap forward for Pixar – there was such a noticeable improvement in human animation, facial expressions, gestures, and performances. Incredibles 2 feels like Pixar have bounded forwards again. In Simoa’s view, “Strong Coffee” functions as a mini documentary, where the subjects are Brad and animation. The director discusses his beginnings at Disney Animation, where he was mentored by the legendary Milt Kahl when he was still a child. (And that mentorship preceded any official program offered by Disney). Fans of Kahl will also be delighted to see some footage of him, as well as Brad’s fond reminisces of his mentor and Disney’s other elite animators, known as the Nine Old Men, who continue to influence him today. Here is a young Brad Bird, looking exactly the same as he does now, with Classic Hollywood and Disney Legend, Fred MacMurray. Unfortunately we don’t have any more details on this photo, but we’re glad it exists! Love hearing Pixarians describe their jobs and the challenges and joys of each film? Paths to Pixar gives viewers just that, but the director, producer, artists, technicians, and animators talk about another job they do at home that’s just as inspiring and challenging: parenting. You may be surprised by this featurette, as some of these Pixarians reveal their vulnerabilities and uncertainties when it comes to both jobs. I think parents and aspiring parents will appreciate this featurette because it’s so honest. Anyone with children of their own can relate to the struggles depicted here, the overwhelming love of family, and the determination, particularly of the women, to be working mothers who don’t have to sacrifice family or work. With Elastigirl front and center in Incredibles 2, it’s only fitting that one of the bonus features focused on her. A team of women, including producer Nicole Paradis Grindle, animators Amanda Wagner and Jessica Torres, and tailoring lead Fran Kalal were on hand to discuss her expanded role. But that’s not all! They also provided insight into their own roles on the film and how excited they were for her to be in the spotlight. “Racoon Fight” was of course about the film’s scene stealer, Jack-Jack, and how that epic fight came to be. Here, Brad Bird is joined by producer John Walker, story artist Pete Sohn, animator Kevin O’Hara, and layout artist Mike Leonard. This scene was so popular back when Teddy Newton pitched the idea for the first film, and Brad was adamant that it be in the sequel. Getting to learn about the behind the scenes is always a treat, because everyone’s passion and enthusiasm is tangible, and the details are fascinating. Joanna’s a pro at finding these! On the UK Blu-ray for Incredibles 2, one of the bonus features listed on the case is simply ‘Easter Eggs’, and I think I may have found them. In the Bonus Features section, while you’re hovering over Bao, press up twice, and you’ll be shown a couple of animation outtakes. One shows Evelyn stroking a teddy bear (?!) while watching Bob and hypnotised-Helen fight. And the other shows Evelyn talking to Helen through the glass of the cold room, pausing to rub off the condensation her breath has made. If you press right twice while hovering over Bao, you’re shown a hilarious clip of Brad Bird telling a story about the inspiration for the iconic raccoon scene – Brad’s dog had a scary encounter with a raccoon at his old house, and Brad was forced to (in Brad’s words) punt the raccoon off of his beloved pet. It’s absolutely worth a watch just to see Brad’s impeccable impersonations of his dog and the raccoon. Honestly, I wouldn’t have minded Brad adding ‘Raccoon’ to his list of voice acting roles in Incredibles 2. Once again, I’m just blown away by the amount of attention and detail that characterizes Pixar’s approach to filmmaking. So much about these bonus features is illuminating. I guarantee everyone will learn something new and come away with even more appreciation for the film itself. For example, character and costume designer Deanna Marsigliese based one of the wannabe supers, Brick, on herself. See the clip below detailing Winston Deavor’s design and personality. A total of ten scenes ultimately didn’t make the cut, but they would’ve been great additions to the film! Thankfully they are included here, and what I wouldn’t give to see them as actual fully animated shorts! But the storyboard versions are really appealing. 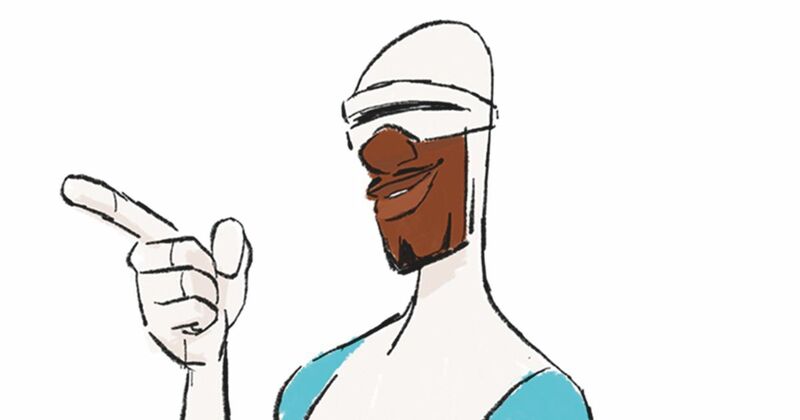 Fans who were hoping for more screentime of Frozone’s wife Honey may be disappointed by “Frozone and Honey,” since it rehashes the supersuit gag from the first film. Brad Bird’s favorite of these is “Kari Revisited,” which you can watch below. This is yet another gem to be added to your collection, if you love Pixar and love moviemaking. Have you had a chance to watch any of these and the other bonus features? Let us know your favorites! Welcome back to Woody’s Round Up! Today’s installment features amazing costumes, more details on Incredibles 2, out on DVD today, and an addition to Netflix. We can always count on the folks at Pixar to get into the Halloween spirit with their creative costumes! This year was no exception. Check them out, courtesy of Pixar’s official Instagram page. 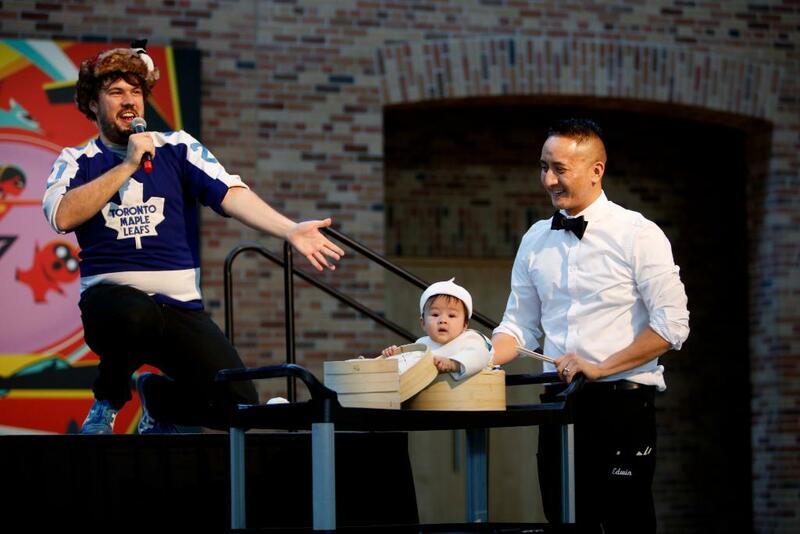 Baby Bao is the clear winner! Incredibles 2 is now on DVD today, so be sure to pick up your copy! But even if you’ve got the digital version and have already watched “Auntie Edna” (lucky! ), you should still check out this interview with the short’s director and story artist, Ted Mathot. Audiences would need to see a new side to the iconic character while Mathot had to remain faithful to her essence. “Getting her out of her comfort zone a little bit, because she’s always the boss, always in control, was really fun to explore. What happens when she loses some of that control? What does that bring out in her character?” Read more from Mathot’s interview at Animation World Network. Concept art by Matt Nolte. Art, story, and technology define Pixar’s approach to filmmaking. Each of those are fascinating to learn about and gives audiences a chance to gain more knowledge about everything that goes into the storytelling we admire so much. Effects supervisor Bill Wattral was interviewed by Shack News about his role and the unique challenges that come with the job. Wattral discusses the tools Pixar uses; existing ones that serve as foundations and the new programs created by the studio itself. These tools are necessary in making the film look as appealing as possible. One of Wattral’s main priorities is foreseeing problems in the tech department before they become unwieldy. A very informative look at the technical aspects of Pixar’s process. The Pixar Story (2007) comes to Netflix on November 18th. The documentary was directed by Leslie Iwerks (granddaughter of legendary animator Ub Iwerks) and is now ten years old. Although much has changed since 2007, the doc is sure to still be a great watch all these years later. Your first look at Auntie Edna! Although brief, this new look at the highly anticipated short film on the Incredibles 2 DVD is something of a throwback to “Jack-Jack Attack.” Unlike Kari the babysitter, Auntie Edna found inspiration in Jack-Jack’s powers. The memorable ending to the previous short had Kari seriously out of her depth, exhausted and relieved to hand the exploding baby over to someone else. In fact, Bob was suffering in a similar way when he discovered his son’s powers, and luckily Edna the babysitter came to the rescue. But as we see in the clip below (and as Edna herself hinted in the film), there was a bit of trial and error when she took on the heroic task of babysitting Jack-Jack. “Auntie Edna” will feature more of Jack-Jack’s powers and more of the super bond between this powerful and tiny sized duo. We can’t wait to laugh and fall in love with them all over again! You can see the brand new short when Incredibles 2 drops digitally on October 23rd and on Blu Ray November 6th. Preorder your copy at this link today. Auntie Edna short to be included on Incredibles 2 DVD! Jack-Jack and Edna stole the show in Incredibles 2, no easy feat for one of the year’s best movies and best sequels overall. Their brief scenes together inspired incredible fan art, and lots of movie goers wished they’d had more screentime. Well, ask and Pixar shall deliver! Three of the most intriguing deleted scenes are Kari Revisited; what has Jack-Jack’s poorly equipped babysitter been up to? ; Frozone and Honey, which will hopefully give us a glimpse of the wife we’ve only heard but never seen; and Fashion Show, because Edna’s designs are always worth seeing. Heroes & Villains: a collection of short documentaries about the origins of the characters and their designs. Strong Coffee: a lesson with Brad Bird (!!!) on animation. Paths to Pixar: Everyday Heroes: featuring the parents of Pixar as they discuss their careers and connections to the film and its themes of family. All this and plenty more! Pre orders are now available on Amazon, cover art to be determined. The digital release drops October 23rd while the DVD and Blu Ray are released on November 6th. There might still be two months left of waiting, but we’re counting the days down until we can add all these gems to our collection!